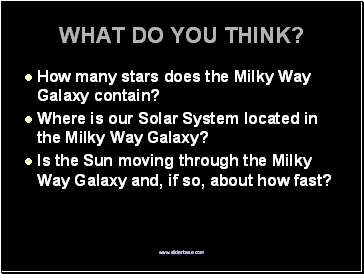 How many stars does the Milky Way Galaxy contain? 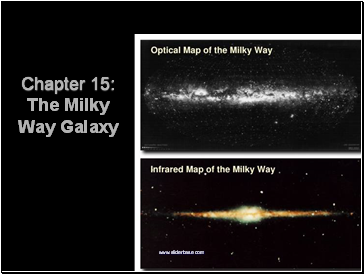 Where is our Solar System located in the Milky Way Galaxy? Is the Sun moving through the Milky Way Galaxy and, if so, about how fast? The Milky Way Galaxy is made of billions of stars, and gas and dust, all bound together by mutual gravitational attraction. The properties of our Milky Way Galaxy. Earth’s location in the Milky Way. 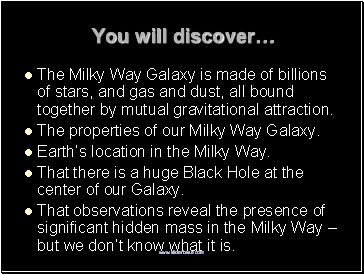 That there is a huge Black Hole at the center of our Galaxy. That observations reveal the presence of significant hidden mass in the Milky Way – but we don’t know what it is. 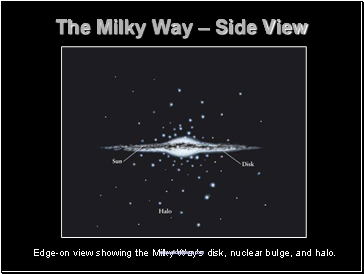 Edge-on view showing the Milky Way’s disk, nuclear bulge, and halo. Top view showing spiral arms. 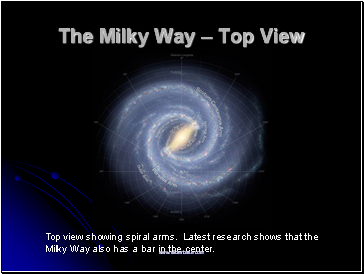 Latest research shows that the Milky Way also has a bar in the center. 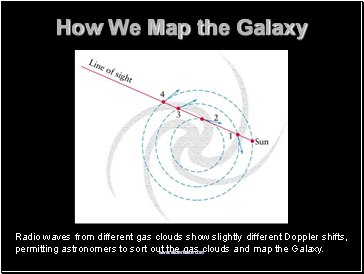 Radio waves from different gas clouds show slightly different Doppler shifts, permitting astronomers to sort out the gas clouds and map the Galaxy. 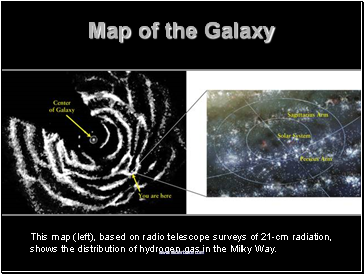 This map (left), based on radio telescope surveys of 21-cm radiation, shows the distribution of hydrogen gas in the Milky Way. How Big? How Many Stars? 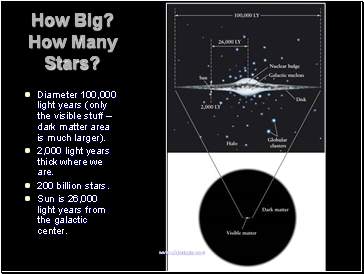 Diameter 100,000 light years (only the visible stuff – dark matter area is much larger). 2,000 light years thick where we are. Sun is 26,000 light years from the galactic center. Nuclear bulge about 20,000 light years diameter. Disk contains gas, dust, and Population I stars (young, metal-rich stars). Halo is composed mostly of Population II stars (old, metal-poor stars). 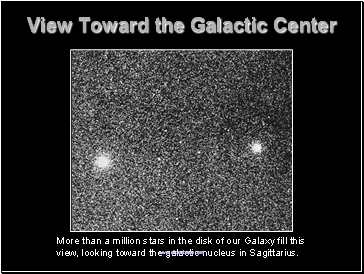 More than a million stars in the disk of our Galaxy fill this view, looking toward the galactic nucleus in Sagittarius.